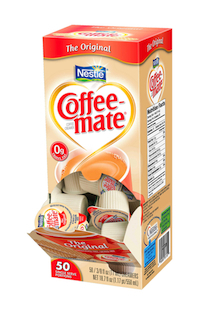 Coffee-Mate Non-Dairy Creamer. No refrigeration needed. Gives coffee a personal touch and personalized taste. Packaging and Product are superb. They come in neat little boxes that can also serve as a storage container. This helps keep your coffee area organized. They DO NOT require refrigeration. This is the traditional, "un-flavored" version. Much better than any "powder" creamer.